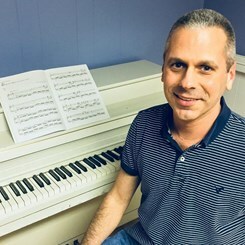 Craig Mavilia has been teaching piano with the Bowie Music and Arts Center since the year 2000. Studying under Nancy Notargiacomo from the age of 7, Craig was awarded a scholarship to Prince George’s Community College where he studied piano, voice, and music theory. He has 15 years of performance experience and now teaches Monday through Friday. Craig teaches site reading and was classically trained. Great with kids ages five and up as well as adults alike whom wish to read, write, and study music theory. Request Lessons with Craig today!